Freedom was yesterday short-lived for one of the two men accused in the 2010 gold miners’ murder as moments after exiting the courthouse, subsequent to the presiding Magistrate discharging the case, he was rearrested by police ranks. The case in question is that of the death of two gold miners Jainarine Raghubar and Ramdeo Deonarine who had been murdered during the course of a robbery. Three years ago at Bartica (between September 4 and September 5, 2010) the men were killed and through intense police investigations, Rawle Newton also known as “Satan’s Ambassador” and ex-soldier Keron Herbert were held accountable for the crime. Yesterday at the Bartica Magistrate’s Court, Magistrate Delon Bess, before whom a Preliminary Inquiry (PI) was conducted, ruled that the prosecution had failed to present the court with sufficient evidence for a case of murder to be established against them and as such discharged the case. Previous reports show the charge was first read to them by the Chief Magistrate Priya Sewnarine-Beharry on September 30, 2010, who had subsequently reassigned the case to Magistrate Bess at the court in Bartica. It was after three years of an unproductive PI that the Magistrate chose to free the duo on grounds of insufficient evidence. At the first hearing, the prosecution revealed its case stating that the two persons were found dead in a house at Bartica and that a quantity of gold and money was also stolen from the house. It was previously reported that weeks of diligent police work led to the arrest of Rawle Newton who was also charged with the murders. Soon after Newton was captured a wanted bulletin was issued for Herbert who was subsequently arrested and brought before the courts to face the murder charge. After being remanded at their first court hearings before the Chief Magistrate, the date for the commencement of the murder PI before the Bartica Magistrate’s Court was set for October 27, 2010. Rawle Newton was being represented by Attorney at Law Latchmie Rahamat who, on yesterday’s occasion, held on behalf of Defence Attorney Glenn Hanoman who represented Keron Herbert. The lawyer made a no-case submission whereby she requested that the Prosecution close their case against the two accused. In her submission, she stated that ten days had previously been set aside for the PI, but time after time the Prosecution’s witness had failed to show. “It breaches the constitutional right of my client to have this case go on as the constitution provides that any person charged with a criminal offence is entitled to a fair hearing within a reasonable time,” she said. Rahamat asked the Prosecution where the ten witnesses were, whom they claimed had remained to testify in the case. “With no witnesses it would be a mockery to the court. Is he to wait another two years for a crime the prosecution cannot prove he committed?” she continued. However, after the case was discharged, they left, but the journey of Keron Herbert was cut short, as about 15 – 20 minutes after he was rearrested by ranks at the Bartica Stelling. Reports are that Herbert was sitting in a boat waiting to head back to Georgetown. 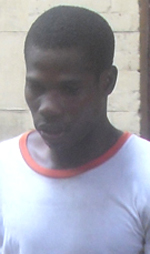 At present, Rawle Newton has not been rearrested.